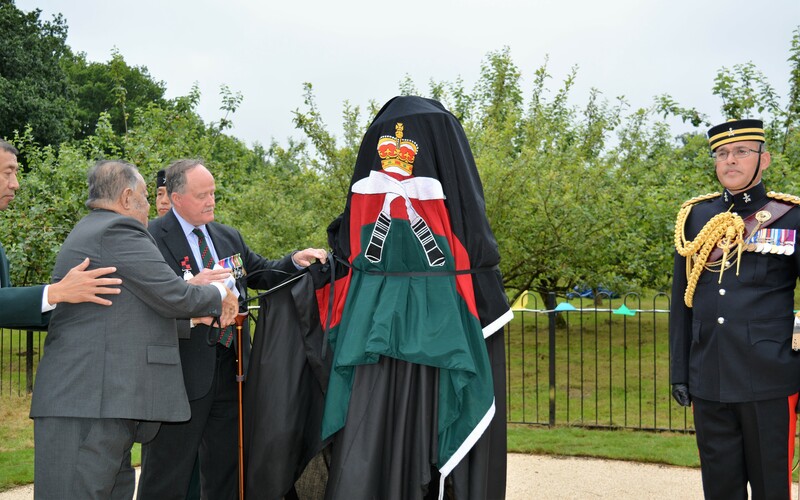 On Sunday 10th July 2016, The Gurkha Statue at Church Crookham was unveiled by Captain (Retd) Rambahadur Limbu VC MVO in front of an impressive crowd of retired and serving military personnel and members of the Church Crookham community, past and present. 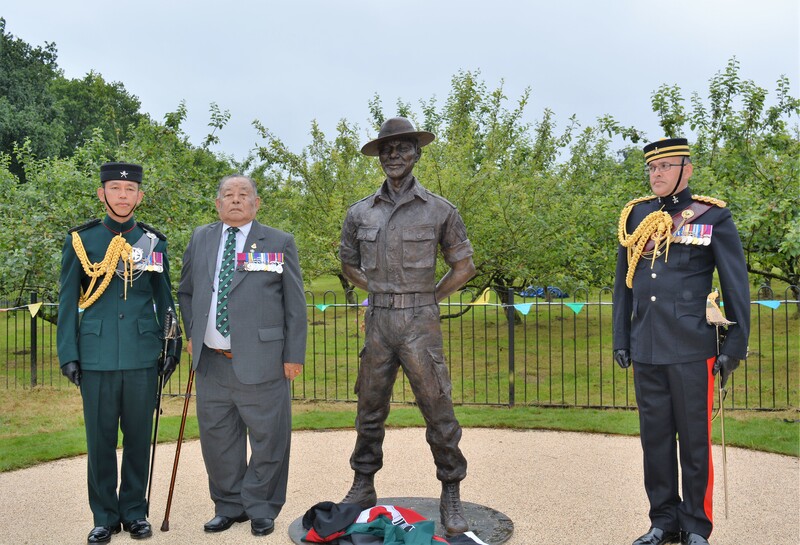 The statue symbolises the 30 years Gurkhas served at Church Crookham and the wonderful relations forged between the Gurkhas and the local community during this time. Church Crookham shall never forget. 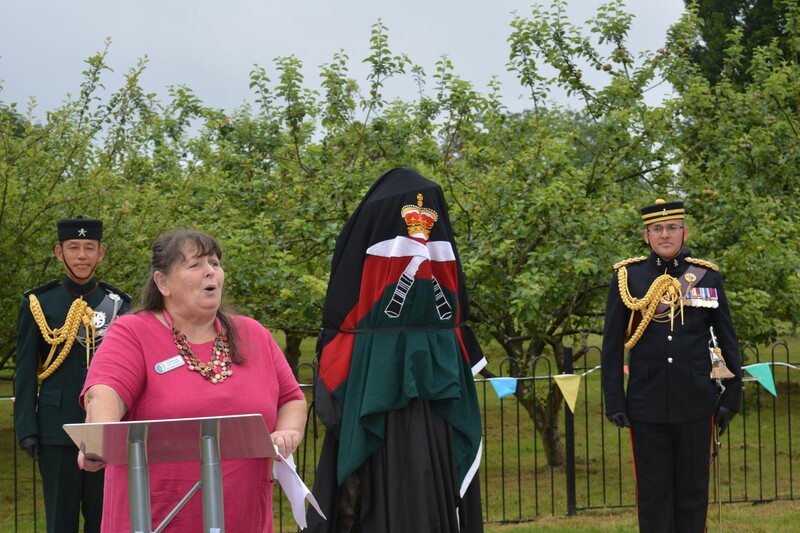 All the guests arrived at the Church Crookham Community Centre in the morning before moving down to the statue site, just a 3 minute walk away. 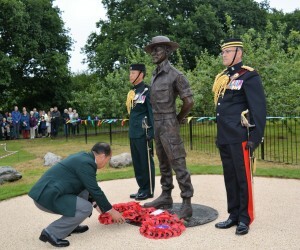 On arrival at the site, the guests listened to music from the Band of the Brigade of Gurkhas. At 11am, the Church Crookham Parish Councillor Pat Lowe addressed the crowd, stating “we remember the smart gentlemen in their green jackets, always polite and smiling as they walked around the village….it was the Parish Councils’ decision to honour the Gurkhas by commissioning a statue to celebrate the Gurkhas and perpetuate their memory”. Tony Carter then spoke about what the public and other serving units had felt about the presence of the Gurkhas from the other side of the proverbial fence. 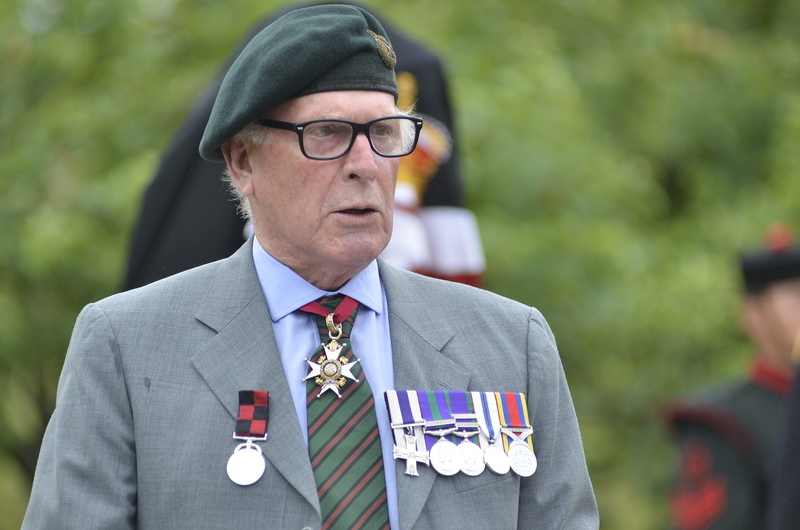 He spoke fondly about the contribution Gurkhas had made to Church Crookham and the surrounding area during their tenure there. 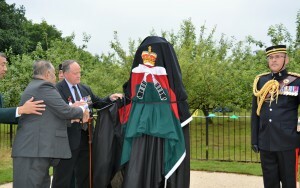 Capt (Retd) Rambahadur Limbu VC MVO (whose citation can be read here) then stepped forward to unveil the Gurkha Statue. 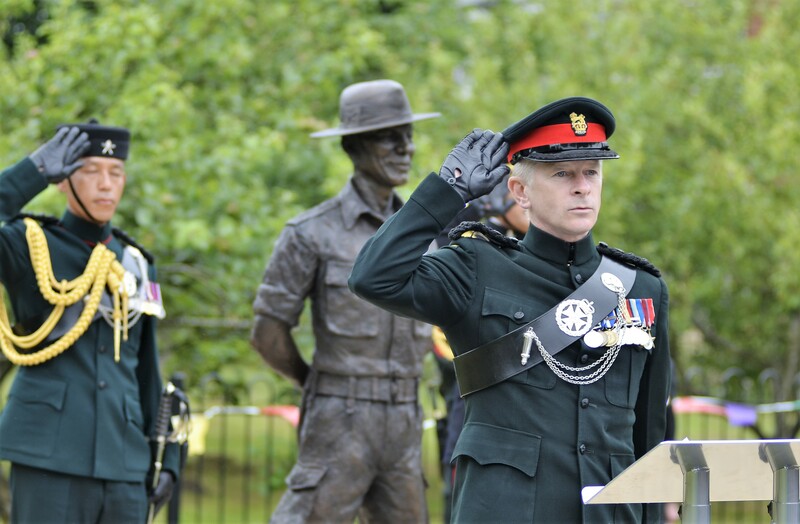 Afterwards Colonel Brigade of Gurkhas, Colonel James Robinson led the Act of Remembrance. Everyone stood still for the Last Post and a two-minute silence before the Reveille was sounded and wreaths were laid at the foot of the statue. Lt General Sir Peter Duffell laid a wreath on behalf of all members of the Gurkha Brigade Association. Major Gajendra Angdembe, the incoming Gurkha Major 2RGR, laid a wreath on behalf of the Royal Gurkha Rifles, Colonel James Robinson laid a wreath on behalf of all serving members of the Brigade of Gurkhas, and the Chairman of Church Crookham Parish Council and a representative from Taylor Wimpey also laid wreaths. After the ceremony, everyone was invited back to the Community Centre by Pat Lowe for a Gurkha curry and cakes, tea and biscuits. 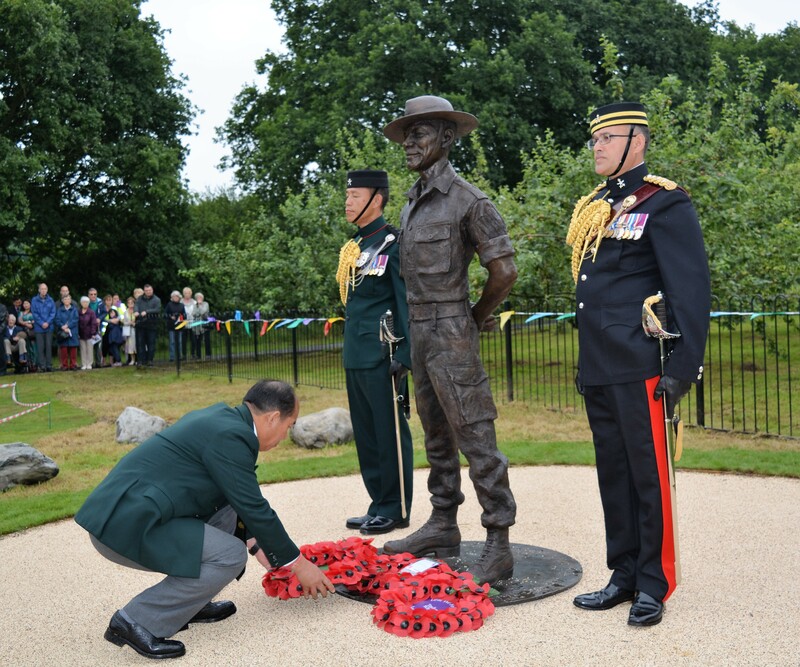 “The Gurkha Statue will be important to the people of Church Crookham and Fleet, as well as to those Gurkhas and their families who will travel to see it as an act of both remembrance and celebration. The sculpture reflects the warmth that the local people have for The Gurkha Regiment, including the young recruits with their reputation of civility, enthusiasm, and cheer. It will mean that a sense of The Regiment’s presence will be retained well after their 200th celebratory year of 2015. From a distance, the statue has a feeling of being on parade in front of the trees of The Sirmoor Orchard. The figure retains a proud upright posture yet “stands easy” in the most relaxed stance on a parade ground. Please have a look at more photos of the day from our gallery.